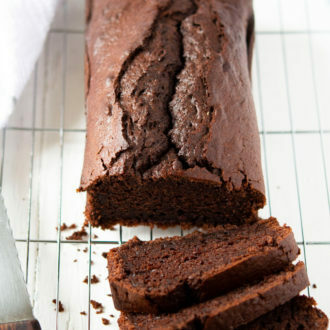 An easy, simple chocolate loaf cake made lighter with the addition of yogurt. The cake is very moist and will satisfy your chocolate cravings. Preheat oven to 350'F. Grease an 8 inch by 4 inch loaf pan. In a large bowl whisk together flour, cocoa powder, baking powder and espresso powder. Stir in salt and sugar. Add yogurt, eggs, and oil. Whisk until batter is smooth. Pour into the prepared loaf pan and bake for 50 minutes or until toothpick inserted in middle comes out clean. Cool in pan before removing and slicing.